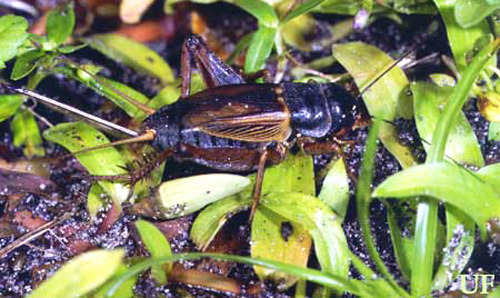 The sand field cricket, Gryllus firmus, is the common chirping field cricket of lawns, pastures, and roadsides throughout Florida. 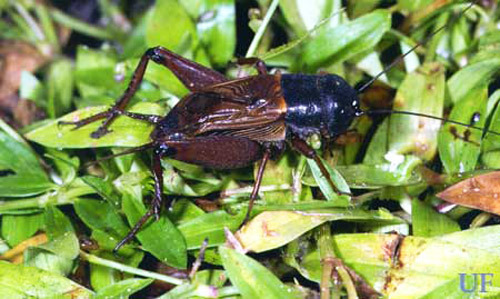 Sand field crickets occur throughout the southeastern United States. To the north and west the species is replaced by the fall field cricket (Gryllus pennsylvanicus). In areas of contact the two hybridize to a minor extent. Figure 1. U.S. distribution of the sand field cricket, Florida's most common chirping field cricket, Gryllus firmus Scudder. The sand field cricket, which chirps, often occurs intermixed with either the southeastern field cricket or the Texas field cricket, both of which are trilling species. These differences in song are stark (song comparisons) as are the differences in the numbers of teeth and spacing of the teeth in the stridulatory files used to make the songs. The only readily accessible morphological difference between the sand field cricket and the two trilling species is the color pattern on the forewings. Figure 2. Short-winged, adult male sand field cricket, Gryllus firmus Scudder. Photograph by Paul M. Choate, University of Florida. Figure 3. Short-winged, adult female sand field cricket, Gryllus firmus Scudder. Photograph by Paul M. Choate, University of Florida. Sand field crickets have the most variable life cycle known for field crickets. During much of the year females lay some eggs that hatch within a few weeks at room temperatures and other eggs that take a month or two to hatch under the same conditions. Furthermore, if potentially quick-hatching eggs are exposed to cool temperatures, some lose that potential. Nymphal development is also variable with some developing quickly and some much more slowly, even when exposed to the same conditions. The effect of all this is that a female's progeny may mature over a 10-month period, with slow developers maturing at the same time as some of the progeny of their faster-developing sibs. In spite of the variability, there are peaks of adults in late spring (mostly from over-wintering eggs) and in fall (mostly from fast-developing progeny of spring adults). This species is characteristic of lawns, pastures, and roadsides, especially those that are well drained and sandy. The calling song (689 Kb wav file) is a series of slow-pulsed chirps, with a chirp rate of about two per second. Most chirps have four pulses, with the initial one being much weaker than the rest (graphs). Capinera JL, Scott RD, Walker TJ. 2004. Field guide to grasshoppers, katydids, and crickets of the United States. Ithaca, NY: Cornell University Press. 249 p.
Harrison RG. 1986. Pattern and process in a narrow hybrid zone. Heredity 56: 337-350. Harrison RG, Bogdanowicz SM. 1997. Patterns of variation and linkage disequilibrium in a field cricket hybrid zone. Evolution 51: 493-505. Pires A, Hoy RR. 1992. Temperature coupling in cricket acoustic communication: I. Field and laboratory studies of temperature effects on calling song production and recognition in Gryllus firmus. J. Comp. Physiol. A Sens. Neural Behav. Physiol. 171: 69-78. Roff DA, Fairbairn DJ. 1993. The evolution of alternate morphologies: Fitness and wing morphology in male sand crickets. Evolution 47: 1572-1584. Walker TJ. 1986. Monitoring the flights of field crickets (Gryllus spp.) and a tachinid fly (Euphasiopteryx ochracea) in north Florida (USA). Florida Entomologist 69: 678-685. Walker TJ. (2014). Sand field cricket, Gryllus firmus Scudder 1902. Singing Insects of North America. (8 April 2014). Zera AJ, Sall J, Grudzinski K. 1997. Flight-muscle polymorphism in the cricket Gryllus firmus: Muscle characteristics and their influence on the evolution of flightlessness. Physiological Zoology 70: 519-529.